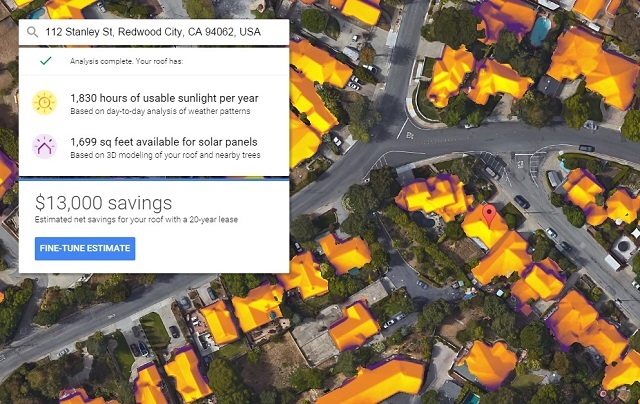 Google recently released Project Sunroof—an interactive online tool that allows building owners to estimate how much money they can save by installing solar panels on their roofs. In short, the tool is a valuable resource for anyone considering solar power as a way to cut utility bills and reduce carbon emissions. However, Project Sunroof is only one piece of the picture. While it’s great that more buildings are powered by renewable energy, and have the tools to make the switch more easily, it’s just as important to reduce the amount of energy that buildings need to consume at all. Most buildings meet their energy needs by consuming electricity that is generated in centralized power plants and travels for miles across inefficient power lines. One alternative is to use electricity generated from clean, on-site resources like solar panels to improve air quality and reduce emissions. But the cleanest, most efficient energy is that which is never produced at all, making building efficiency a top priority that should be tackled before installing renewable energy solutions. Net zero energy buildings (NZEB) are buildings that capture this idea that buildings can improve efficiency and meet their energy needs with on-site energy resources, like solar panels. Importantly, minimizing energy consumption through energy efficiency is the first step—and most cost-effective element—of net zero energy buildings. After the greatest possible cost-effective level of efficiency is achieved, then renewable energy systems are used to meet the remaining energy needs. Increasing clean energy but ignoring efficiency results in significant unnecessary costs for energy systems and the citizens and businesses they serve. Instead of concentrating primarily on renewable energy alone, city leaders, in both the public and private sectors, should prioritize an “efficiency first” approach to achieve net zero buildings goals. Net zero strategies can be applied to both commercial and residential buildings through new construction and retrofits of existing buildings. For example, the Bullitt Center in Seattle—one of the greenest commercial buildings in the world—has pursued not only net zero energy but also net zero water, net zero carbon, composting toilets, and toxic-free materials. 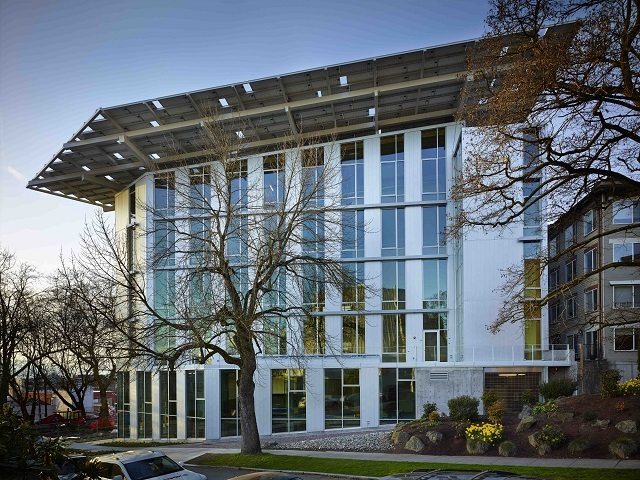 The Bullitt Center has followed the core of the NZEB approach—tackle demand, then supply—in order to achieve net zero energy. First, managers maximized energy efficiency through passive lighting, ground-source heat pumps and a heat recovery air system. Then they covered tenant-responsive energy management, using adjusting temperature set-points and automated controls. The Bullitt Center’s final step was the installation of a 242 KW solar photovoltaic system to meet their remaining, but greatly reduced, energy demand. So far, most net zero energy buildings have been built in developed countries. However, net zero energy or near net zero buildings are an increasingly popular idea in emerging economies, such as India and China. Beyond individual buildings, decision makers can also apply NZEB principles on a citywide scale. For instance, the city of Cambridge (MA) in the U.S. has adopted a Net Zero Action Plan to improve the efficiency in local buildings since they generate over 80 percent of the city’s total GHG emissions. To achieve this, the plan aims to retrofit existing buildings, promote new construction oriented around net zero, and shift the energy supply toward renewable sources by evaluating solar options and developing a low carbon energy supply. The city estimates that energy efficiency can reduce emissions from buildings by 70 percent over 25 years. Which brings us back to Project Sunroof and how to make it better. Project Sunroof draws on a user’s average electric bill to customize the recommended size of the solar installation, the cost and what percentage of the building’s electricity would be provided by solar energy. However, the tool implies that the monthly bill is constant. It does not include recommendations for improving energy efficiency and reducing their bill. An important future step for the development of Project Sunroof is to allow users to explore building efficiency options and then connect users with service providers in their area who can help them to reduce energy use before or at the same time as a solar installation. The My Home EQ tool in the Chicago area is a good example of an efficiency-focused tool. My Home EQ provides information on the actual energy use and physical characteristics of specific buildings and offers building-specific recommendations for improving efficiency. Since their tool does not yet combine efficiency with solar installation recommendations, it could be a great partner for Project Sunroof. A screenshot from Google’s Project Sunroof, displaying the viability of solar panels for individual homes in Redwood City, California. A tool that advises users to first improve energy efficiency, then implement renewable energy solutions would be very helpful in demonstrating to building owners and city leaders that prioritizing efficiency improvements before solar installations would drastically reduce the size and cost of solar systems. Furthermore, this would also enable many more buildings to meet their complete energy needs with on-site technology, something that would be impossible for most buildings without higher efficiency. Project Sunroof offers buildings a great starting point—but the next step is pushing it to become even better. Maximizing efficiency minimizes the cost and size of needed renewable energy systems, making the journey to low-carbon buildings more affordable, helping achieve the vision of “net zero” energy, and providing a host of other benefits. Now we need a tool that helps building owners easily assess, understand and implement this path forward.